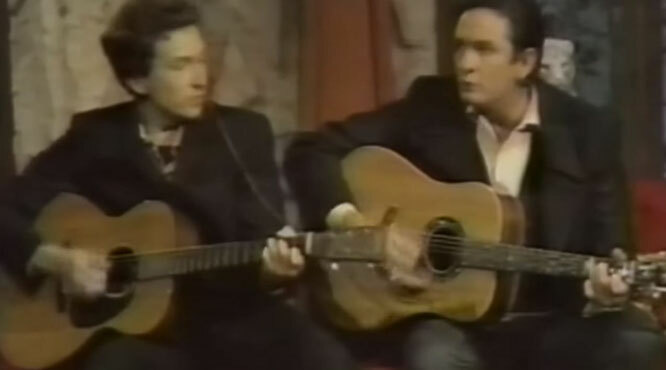 Johnny Cash and Bob Dylan performs "Girl From The North Country"Live on the Johnny Cash Show. "Girl from the North Country" (occasionally known as "Girl of the North Country") is a song written by Bob Dylan. It was recorded at Columbia Recording Studios in New York City in April 1963, and released the following month as the second track on Dylan's second studio album, The Freewheelin' Bob Dylan. Dylan re-recorded the song as a duet with Johnny Cash in February 1969.That recording became the opening track on Nashville Skyline, Dylan's ninth studio album. Live performances by Dylan appear on the albums Real Live (1984), The 30th Anniversary Concert Celebration (1993; recorded 1992), and The Bootleg Series Vol. 13: Trouble No More 1979–1981 (Deluxe Edition) (2017; recorded 1981). A February 1964 performance for Canadian television was included on the DVD release of Martin Scorsese's PBS television documentary on Dylan, No Direction Home in 2005.